GMail vs Zoho Mail. What is the best Business Email software? 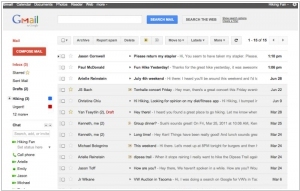 Gmail is a free, advertising-supported email service provided by Google. Users may access Gmail as secure webmail, as well via POP3 or IMAP protocols. Gmail's spam filtering features a community-driven system: when any user marks an email as spam, this provides information to help the system identify similar future messages for all Gmail users. Google also provides GMail alternative for business - G Suite Mail. Zoho Mail is an email hosting service built with the needs of a modern business in mind. It provides best-in-class features exceeding even those of desktop emailing software for business users to communicate effectively while catering to the fine-grained customization and mailbox management needs of IT administrators. Additionally the seamless contextual integration with 20+ other Zoho applications provides higher productivity & collaboration. Just a week after major GMail interface update, Zoho released new Zoho Mail 2018 with cool new design. The developers decided to help the icons in the App bar, and the Quick Actions buttons, stand out more by redesigning them and making them more colorful. For those who like the Compact view because it lets you view more emails at once, we’ve taken it a step further with the Super Compact view. The new Advanced Search helps you track down elusive content hiding in your inbox, even with the tiniest detail you can remember. With the tabs and search bar replacing the top bar, the other icons on it are shifted to the right side of your mailbox for better visibility. 2017 - Gmail adds support for third-party add-ons. Your move, Zoho Mail ! Google updated Gmail app with an AI-driven "Smart Reply" feature that predicts responses you may want to send. 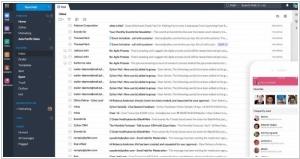 The feature uses machine learning to analyze your emails and suggest quick, bite-sized responses you may want to send. Smart Reply suggests three responses based on the email you received. Once you’ve selected one, you can send it immediately or edit your response starting with the Smart Reply text. Either way, you’re saving time. Gmail Smart Replies are available now in both the iOS and Android app in English. social constructs – like tagging people, without having to forward, manage, and sort through long email threads. The new Attachment Viewer uses pictures, and neatly organizes all of your attachments by type. Now you can see and choose the one you want. You can also create a task, a note, or a calendar event, from any email message where you have the right context and relevant details. And you can now email folder without forwarding emails one by one. Zoho Mail also provides two mobile apps: first is called Zoho Mail - with mail, calendar and contacts, and second - Inbox Insight – a clever search app for your email. What Google needs to do to entice users from Outlook to GMail? For example, make GMail look like Outlook. Now it's possible. You can add the Preview pane to your GMail inbox, placing it in the third vertical column (like at the screenshot) or under the messages list. The feature can be turned on in the GMail Labs. But between the left nav sidebar, the list of messages, the message itself, and then the right sidebar - which includes the new People Widget and ads - there’s a lot going on in the inbox. As known, Zoho uses to make friends with Google. Despite the fact that both companies are developing online offices for SMB, Zoho always combines its applications with Google Apps, rather than compete with them. Zoho is the champion by the number of applications in the Google Apps Marketplace (i.e. integrated into Google Apps). And maybe that's why Zoho for a long time didn't touch the holy grail of Google Apps - email app GMail. In fact Zoho launched it's email service (Zoho Mail) almost two years ago, but it was just a personal email service. It was as functional as GMail and even allowed to use your own domain, but it had no administrative panel that allows to create accounts and manage security policies. So it couldn't be used as a corporate mail server. Now it can. But we don't think that Google will apply any political sanctions against Zoho because Zoho Mail - is no longer completely free, so won't influence Google's business much. It's free only for 3 users with 1GB mailbox limitation. After that - you have to pay $2 per month per user. At the same time, Google Apps Mail provides free version for 50 users with 7.5Gb mailboxes. Moreover, Zoho Mail - it's not just mail and contacts, but also super-calendar (Zoho Calendar), which is not inferior to Google Calendar and Tasks module that makes Google Tasks look like a toy. There is also the Notes section, but it's not the powerful Zoho Notebook, but a simple notes list. The value of Zoho Mail can be considerably increased by integration with other Zoho services - messenger Zoho Chat, office editors Zoho Docs, CRM system Zoho CRM ... Funny, but Zoho Mail is better integrated with Google Docs, than GMail. In particular, Zoho Mail allows to send files directly from your Google Docs account. And, as we noted, Zoho Mail now has the control panel where administrator can add / remove users and groups, assign roles, mailbox quotas, add domains, configure filters, unjust security settings.